The series focused on San Francisco Police Detective Frank Kohanek who discovers his city is home to numerous vampires while investigating alleged mobster, Julian Luna . 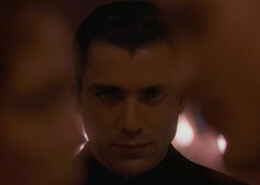 Julian is the “prince” of the city, ruler of five groups of vampires in the city, collectively called “The Kindred”. The vampires survive through the “masquerade”, disguising themselves as humans, and Julian strictly enforces the laws that govern them to protect their anonymity. Julian and Frank form an uneasy bond as they work together to try to prevent a vampire war and Julian struggles with his romantic feelings for a human reporter who puts his kind at risk of exposure. One of my favorite fan made videos set to music “So Cold” by Breaking Benjamin mainly focusing on the development of Cash and Sasha’s relationship. Another fan made video set to the music of “Ordinary” by train, mostly focusing on the Character Julian Luna. Plots for all 8 episodes coming soon!